A corporation is created under the laws of a state as a separate legal entity that has privileges and liabilities that are distinct from those of its members. There are many different forms of corporations, most of which are used to conduct business. Early corporations were established by charter. Most jurisdictions now allow the creation of new corporations through registration. An important (but not universal) contemporary feature of a corporation limits liability. If a corporation fails, shareholders may lose their investments, and employees may lose their jobs, but neither will be liable for debts to the corporation’s creditors. Despite not being natural persons, corporations are recognized by the law to have rights and responsibilities like natural persons (“people”). 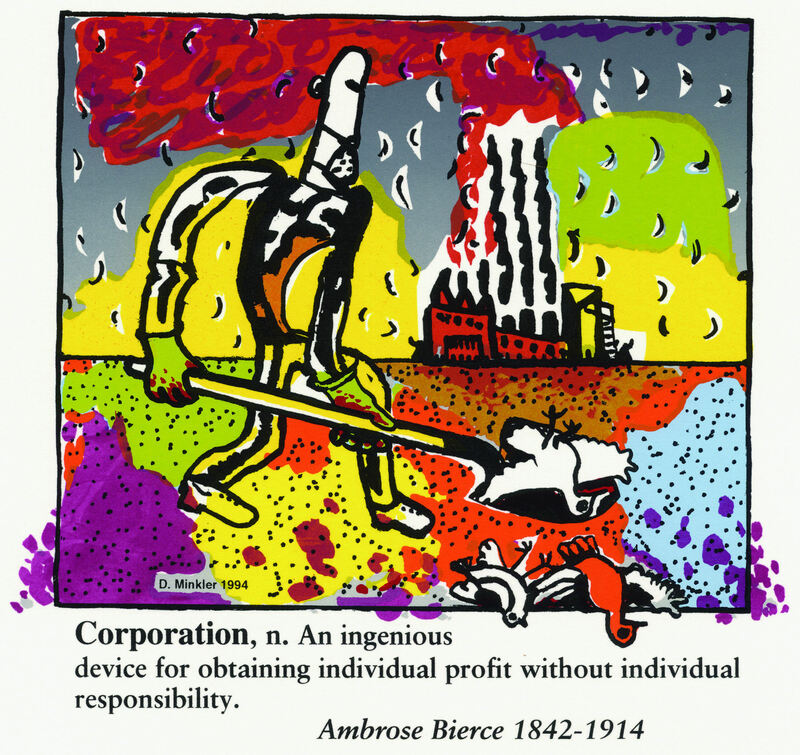 Corporations can exercise human rights against real individuals and the state, and they can themselves be responsible for human rights violations. Corporations are conceptually immortal but they can “die” when they are “dissolved” either by statutory operation, order of court, or voluntary action on the part of shareholders. Insolvency may result in a form of corporate ‘death’, when creditors force the liquidation and dissolution of the corporation under court order, but it most often results in a restructuring of corporate holdings. Corporations can even be convicted of criminal offenses, such as Fraud and manslaughter. These Profiteers are guilty of committing atrocities (War Crimes, torture, toxic dumping and stiffing freedom of speech) against mankind in the name of Greed. Corporations carry out some of the most horrific human rights abuses of modern times, but it is increasingly difficult to hold them to account. Economic globalization and the rise of transnational corporate power have created a favorable climate for corporate human rights abusers, which are governed principally by the codes of supply and demand and show genuine loyalty only to their stockholders. Even a weekend management course is a Cult. Comes in all shapes, forms and sizes. Are you part of a group of people?